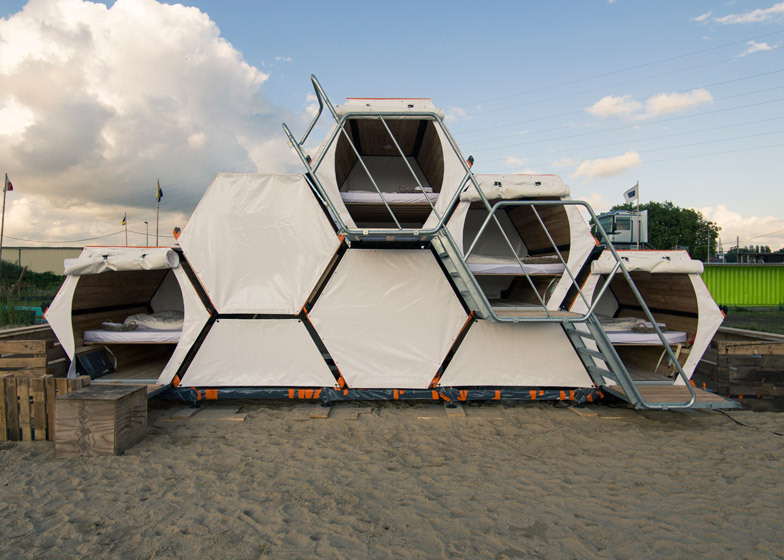 This modular honeycomb of wooden cells by a team of Belgian designers could provide a solution for people avoiding music festivals because they don't like sleeping in tents (+ slideshow). 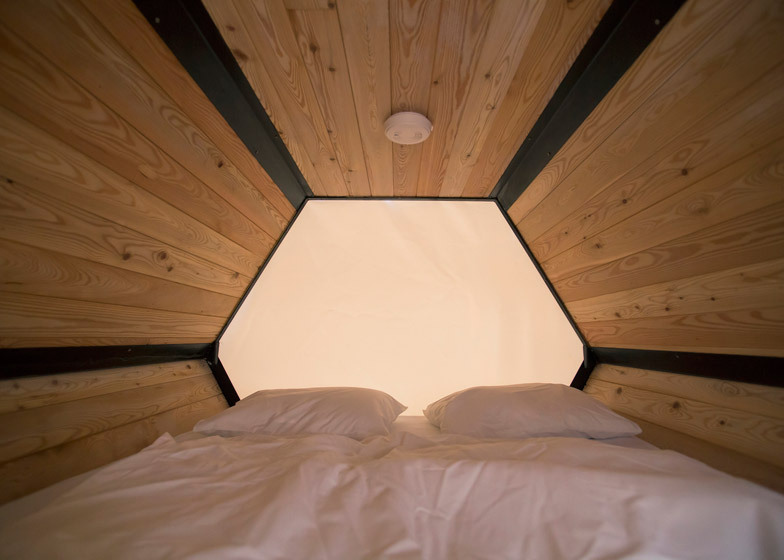 The B-and-Bee hexagonal sleeping cells each contain a king-size bed that can transform into a lounge seat, with storage space underneath. Lockers, lights and a power supply are also included in the larch wood-clad cells, which can be stacked four high in a diagonal line to accommodate 50 revellers on 100 square metres of ground. 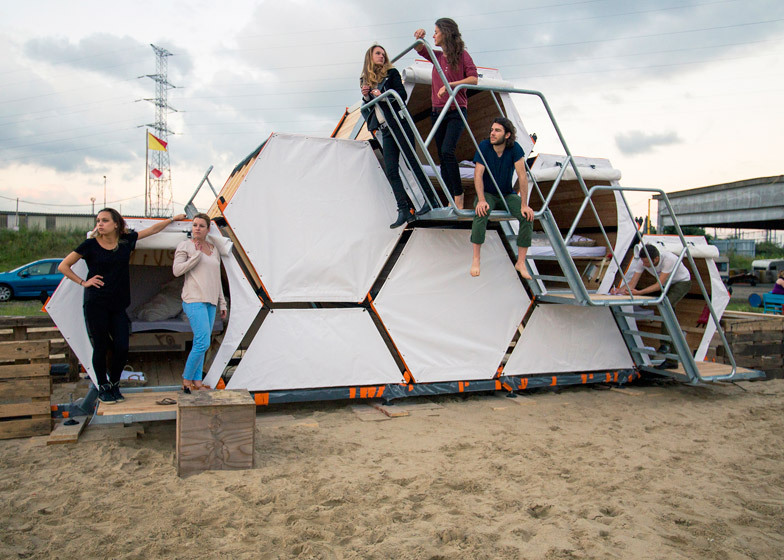 "We thought, why not stack a honeycomb, not for bees, but for festival goers to offer a very comfortable, cozy alternative for the overbooked and overpriced hotels during festival times?" said co-inventor Barbara Vanthorre. 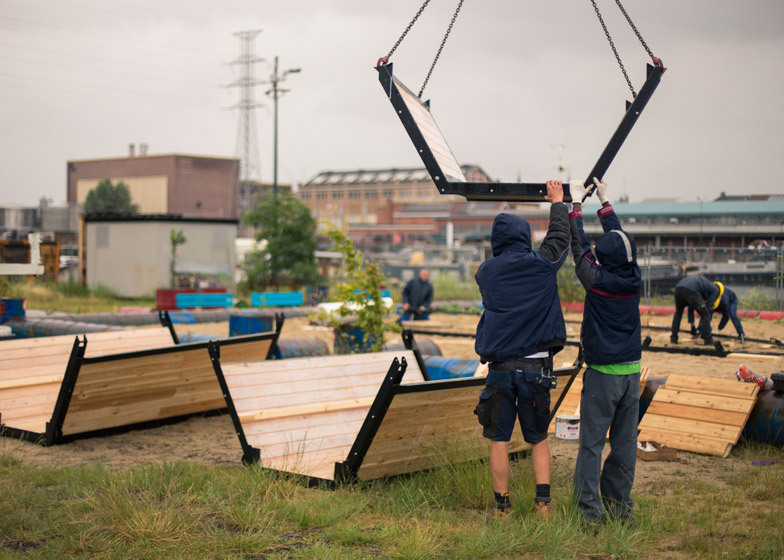 Each module is winched onto a base frame using a crane, forming an interlocking stack. "B-and-bee can be setup quickly, anywhere and using only a very small footprint," said the design team. "It's not only designed for remote campsites, but meant for the middle of the action as well." Roll-up fabric covers protect the occupants from the elements, but can be secured open to let in air or allow the users to watch performances from inside. Lightweight metal steps are used to access the upper compartments, following the angles of the hexagonal frame to prevent blocking access to any of the units below. Six cells are currently being tested at the Gentse Feesten in Belgium, which runs until 27 July. "In order to meet all the requirements and the specific needs of all the stakeholders, our team was in constant consultation with security agencies, festival organisations and urban services," said the design team. 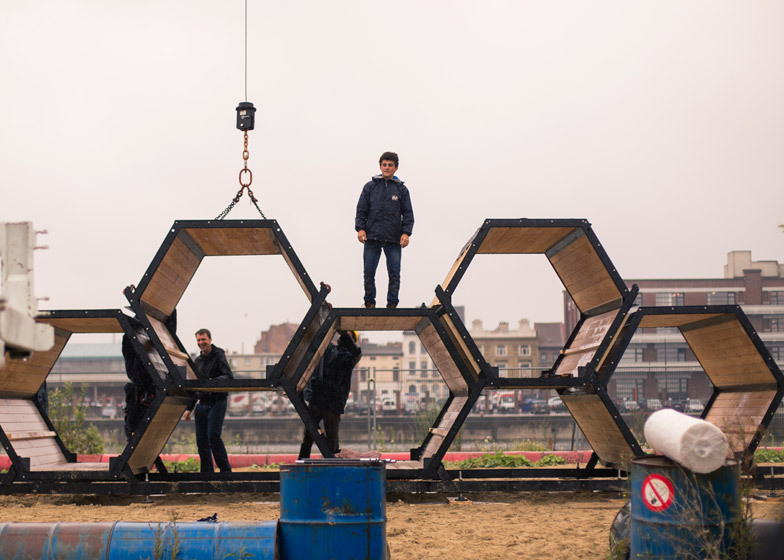 The initial concept was proposed a year ago by social entrepreneurs at Compaan and Labeur, which collaborated to win a a sustainable innovation competition in Antwerp with the idea for a Honeycomb Hotel. 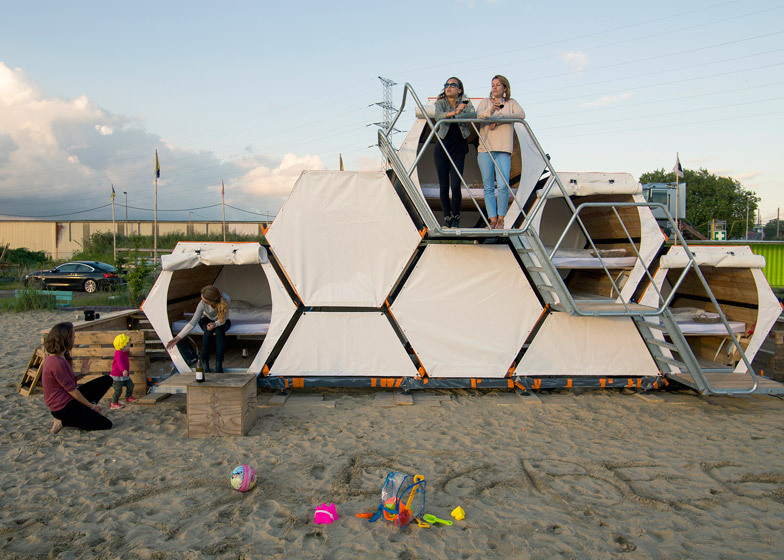 The inventors Barbara Vanthorre and Ron Hermans then teamed up with product, service and brand design agency Achilles Design and business consultancy One Small Step to form B-and-Bee, and began speaking to festival goers to learn about their requirements for ideal accommodation. The team began building prototype designs and refining the system for transportation, operation and maintenance. They hope to begin mass production this Autumn, following final feedback from users.